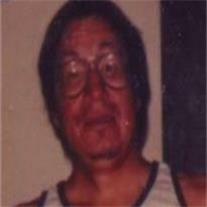 Carl DeWayne Standing Elk, 59, passed away August 13, 2012 in Mesa, Arizona. Wake services will be Thursday, August 23, 2012 at 6 PM at Salt River Memorial Hall, 9849 E. Earll Drive, Scottsdale, AZ 85256. Graveside services are Friday, August 24, 2012 at 7 AM at the Lehi Cemetery, 926 East Thomas Road, Mesa, AZ 85203. Arrangements by Bunker’s Garden Chapel.